I’m loving this quilt. It might be one of my favorites to date & the first time I’ve ever made a quilt with raw edges. The inspiration for this one came from this quilt hanging in my Mom’s living room, and I wanted something that would match this, but not be the same. I wasn’t so sure about the raw edges, but now after its washed I love the 3D effect it gives the circles, and it looks like its been loved for years. The 1st round of quilting I did straight lines around each square, but I hated the way it made the circles poofy, plus I hated the minky back I put on..it was way too heavy. For the second try I did stippling around each circle and then big free motion swirls in each circle. For the back I used a flannel by Moda & the binding is Katie Jump Rope. Its bigger than I intended, but I figure it will work for a toddler bed as baby #2 gets older. Finished its about 42″ x 56″. I took pictures while I was making this so I can make a tutorial, so hopefully I’ll finish that up and get it posted in the next week. Happy Monday and remember Sew Mama Sew giveaway day is Wednesday! absolutely GORGEOUS! I can't wait for the tutorial! Ooh, I love it! Great job. That will look so cute matching with your other child's quilt. The fabrics and design are adorable! I love this quilt!! I am so happy that you are going to give us a tutorial!! Can't wait! Thank you! Hi Allison, I really like raw edge applique for two reasons it's easier of course and it's so whimsical and fun when finished and washed. I have a pattern called French Roses that is done this way…you may have inspired me to get to it! Your baby will love the texture on the edges of the circles! What a fabulous quilt! Beautiful work. That turned out great! I love the look, all the colors, and the quilting. Absolutely love this! WOW!!! I love the colors and the shapes. THANKS for sharing this lovely quilt. I want to make one now. I am having a giveaway on my blog of an antique doll quilt! One week left for the drawing! Thought you would like to know! That's gorgeous! Loving the 3D-ness of the circles too. I'm amazed that unpicking the first round of quilting went so quickly! Looks great. I am hoping to try the raw edge applique next year. fabrics look gorgeous. Love the fabrics and colours!!! Great fabrics! And who doesn't adore circles? Gorgeous quilt and I love the 3d effect. Again your material does a lot for the quilt what is your secret? 3D is the perfect description. This is awesome. Super cute way to get a pieced circle look! Can't wait for the tutorial! This is just gorgeous! Tutorial: Yes, please! Is this called Bullseye? I love your color choices. Such a wonderful job! to echo all the other comments – beautiful! I love it – i'm sure the time spent making it just right has proven worth it. excited to see the tutorial! This is stunning… I love it! That quilt makes me swoon…I love it. Can't wait for the tutorial. It's gorgeous! And I love the sunny colors. I love it! It looks so happy. very cute!! See, now this is one I could do since there is no curved piecing involved. It looks fabulous! Doesn't it just make you so excited to have that baby and wrap him up in it?!! I'm so glad all that unsewing worked out for you. It looks amazing! What a great quilt! I can't believe you unpicked it all and then redid the backing too. OY! LOVE IT and look forward to a tutorial. Its gorgeous. I love the lush colors…and those circles. I am sure baby #2 will treasure it with all his heart. Very, very cute! I would love a tutorial! I freaking LOVE IT!! Can't wait for the tutorial! The 3-D look of the circles is very cool! Crazy insane jealous. That is gorgeous! Love the colors, love the circles, love the fabrics. Baby blankie perfection. I came over from the sew mama sew site for the giveaway, but just had to comment on your quilt. It's beautiful! You did a fantastic job, I really like it a lot! Oh, I am loving it too!! Really loving it. You do such amazing work. OH my! 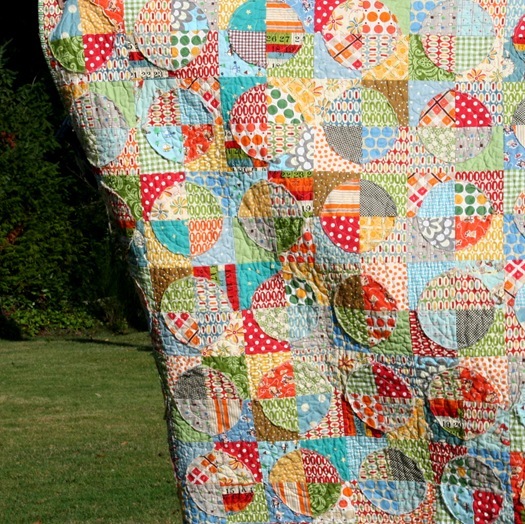 that is one gorgeous quilt, I LOVE your fabric you used. PLEASE pretty PLEASE do the tutorial! I can't wait for that! That turned out so beautiful! I love that it already has that "loved" look. Baby #2 is going to love it. What an awesome quilt! 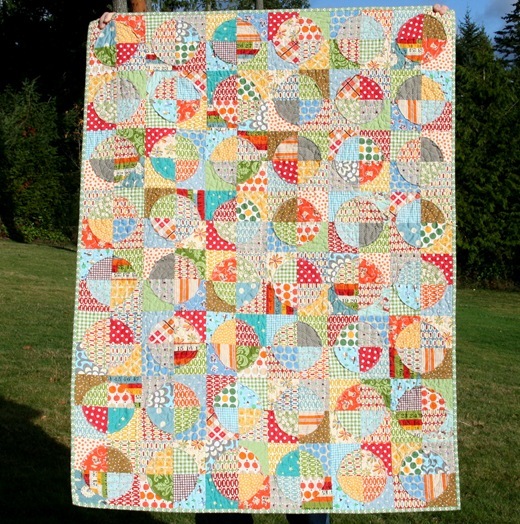 I love the circles and the fabric colours and, and, and the whole thing! It's so fab! 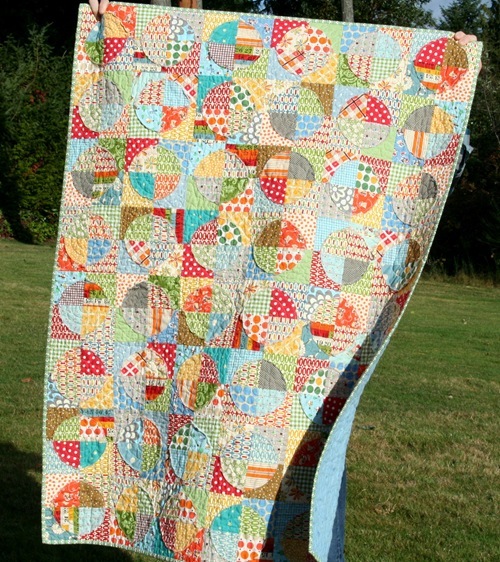 I've added this quilt to my list of inspiration quilts for one day when I start quilting again… I hope that is okay. You are amazing. I can't wait for a tutorial! it's sooooooooooo amazing!!!!!!! i've had one on the brain similar to this, and here you have one completed and so beautifully, too!! i personally think that it's a perfect baby size. it's nice when a baby quilt is also toddler size. totally cute! ingenious method too! this quilt is fantastic! I'm going to give it a try. Look out stash, here I come! Just found your blog, it's wonderful! I make all my baby quilts about that size, that way they can use it longer, like you say, as they get older.